So much have been written about Bloom’s taxonomy; one click in a search engine will flood your page with hundreds of articles all of which revolve around this taxonomy. Only few are those who have tried to customize it to fit in the 21st century educational paradigm. As a fan of Bloom’s pedagogy and being a classroom practitioner, I always look for new ways to improve my learning and teaching, and honestly speaking , if you are a teacher/ educator and still do not understand Bloom’s taxonomy then you are missing out on a great educational resource. The following article is a summary and a fruit of my long painstaking research in the field of Bloom’s taxonomy. The purpose is to help teachers grow professionally and provide them with a solid informational background on how to better understand and apply Bloom’s taxonomy in classrooms in the light of the new technological advances and innovations..
Bloom’s taxonomy of learning as Wikipedia has put it is “ a classification of learning objectives within education proposed in 1956 by a committee of educators chaired by Benjamin Bloom ”. Although it received little attention when first published, Bloom’s taxonomy has since been translated into 22 languages and is one of the most widely applied and most often cited reference in education. Bloom, being convinced of the importance of thinking behaviors in the processes of learnign, had spearheaded a group of brilliant educational psychologists to undertake the task of classifying educational goals and objectives. They first came up with a general framework which was turned later on to a taxonomy of 3 domains. Bloom created different levels for both the cognitive and affective domains but never fully detailed the psychomotor domain leaving it for others to complete the task. Let us now go through the different domains stated here. Apart from the diagram created by me and labelled after me all the other pictures and diagrams are taken from different sources. When you click on a picture it will direct you to its source. It involves knowledge and development of intelectual skills from Lower Order Thinking Skills (LOTS ) to Higher Order Thinking Skills ( HOTS ). They are arranged below in an increasing order from lower to higher order. Skills in this category describe the way people react emotionally and their ability to feel another living thing’s pain or joy. The five major affective categories are listed from the simplest behavior to the most complex. Set :Readiness to act. It includes mental , physical and emotional sets. Guided Response : Adequacy of performance is achieved by practicing. Complex Overt Response : The skillful performance of motor acts that involve complex movement patterns. Before we can understand a concept we must remember it. Before we can create we must have remembered, understood, applied, analyzed and evaluated. This new taxonomy reflects a more active form of thinking and is perhaps more accurate. With the advance of technology into our lives and particularly into education , we started to talk about new emerging skills and competences that Bloom’s first taxonomy did not include. Below is a diagram i have created to include these new skills which corresponds to the 21st century learning. Blooms Taxonomy for iPads taken from iPad Applications in Bloom’s Taxonomy. Today, we’re pleased to announce that users in the UK, France, Italy, Germany and Spain can now use Voice Actions in British English, French, Italian, German and Spanish. Today, we launched a new version of Google Goggles that enhances the camera on your Android-powered phone. With this new opt-in feature in Goggles, you can simply photograph an image using your phone’s camera, and Goggles will work in the background to analyze your image. If your photo contains items that Goggles can recognize, the app will notify you. When Facebook first appeared in Harvard university its membership was initially limited to students of this institution and then later on expanded to other colleges and highschools until finally it became accessible to anyone in the world aged and over.
" is a printed or online directory found at American universities consisting of individuals’ photographs and names. In particular, it denotes publications of this type distributed by university administrations at the start of the academic year with the intention of helping students get to know each other. " From the start Facebook was academically oriented towards helping Harvard students in their studies. It has since then made several inroads into education till it becomes now one of the major players in this field. Many colleges and universities are using its services to recruit candidates and to publicize events on and out of campus. Apart from the promotional role it can play , its educational importance is clearly visible to everyone and it will unfair if we discard it because of privacy issues or any other negative effect it might bring around. 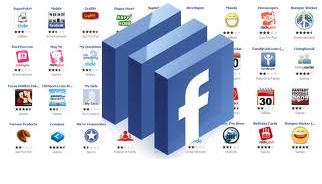 We the educators MUST know the educative uses of Facebook and implement them in our teaching. In this regard, I have conducted some research into this particular area and have divided my findings into two articles one is entitled Reasons Why Facebook is Revolutionizing Education , where i have provided reasons and tips for educators on how to use this social networking in their classrooms, I have also included a paragraph about the potential side effects of Facebook and how educators can avoid them. The second article is the one you are reading . It is in fact a back up to the earlier post in that it includes a list of the best learning applications Facebook offers to its users and that educators can use in their daily work. All thankfulness and gratitude go back to Davis Tiffany from Online College Classes who ordealed to prepare and present this list to the readers. To make it easy for you to find the apps you want , all the applications have been organized into different categories just pick up the one you want and click on the link to use it. Manage your study group, projects, and more with these apps. These Facebook apps will make your life and learning more organized. These apps make Facebook play nicely with other tools that are great for learning and productivity. You can learn a lot from these Facebook apps, and even share knowledge, too. Learn a new language through Facebook by using these apps. These Facebook apps will make studying a snap. You can save money by selling your books, finding deals, and more through these Facebook apps. Use these Facebook games to build your brain power. What French philosopher are you?